+ Now You Know! : Santa's a Ham! 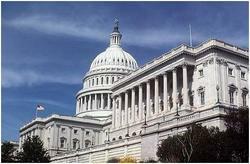 On Monday, December 14, S 1755 -- The Amateur Radio Emergency Communications Enhancement Act of 2009 -- passed the Senate by unanimous consent; the bill now goes to the House of Representatives for consideration. Sponsored by Senator Joe Lieberman (ID-CT), and Senator Susan Collins (R-ME), S 1755, if passed, would direct the Department of Homeland Security (DHS) to undertake a study on emergency communications. S 1755 points out that "There is a strong Federal interest in the effective performance of Amateur Radio Service stations, and that performance must be given -- (A) support at all levels of government; and (B) protection against unreasonable regulation and impediments to the provision of the valuable communications provided by such stations." Read more here. When Dave Nicholson, N2AWE, was stranded at sea earlier this month off the Bermuda Triangle, he had no fuel and his 47 foot sailboat had sustained severe damage in a storm. When they learned of his predicament, hams with the Maritime Mobile Service Net (MMSN) helped to coordinate with the US Coast Guard to bring fuel and a tow boat to guide Nicholson safely to port. Read more here. In the past, funds raised for the ARRL Spectrum Defense Fund have helped the League keep commercial satellites out of the 144 and 420 MHz bands, gain access to frequencies around 5 MHz, and to win our court challenge of the FCC's flawed Broadband over Power Lines (BPL) rules. Currently, the ARRL is working to ensure that new short-range medical devices do not impact our ability to use our UHF and microwave bands. Your donation to this valuable fund makes such work possible. Chief Development Officer Mary Hobart, K1MMH, reports that the ARRL has raised more than $221,000 toward the goal $310,000 for the 2009 Spectrum Defense Fund. "The messages I receive from the ARRL members and hams who contribute to this much needed fund are heartening," she said, "expressing appreciation for all the work ARRL does for the Amateur Radio community to protect our frequencies. And we can all be proud of the successes that have come from the work of ARRL leadership -- the Board and staff here at HQ. But there is always more to do." Hobart said that year after year, ARRL members tell her that the League's representation of radio operators -- both in Washington and on the international stage -- is one of, if not the most important activities that the ARRL does. "The cost of that representation at meetings in Washington, at ITU gatherings and working party meetings to prepare for world telecommunications conferences is the key to the continued success of our defense efforts," she said. 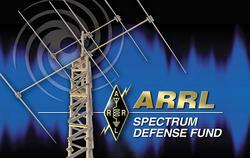 "Spectrum Defense is one of those areas that is not covered completely by member dues. So we ask ARRL members to do what they can to help cover those expenses." Amateurs wishing to make a contribution may do so easily online, via postal mail or by calling the ARRL Development Office at 860-594-0397. 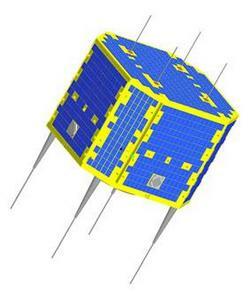 AMSAT China (CAMSAT) reports that at around 0230 UTC on December 15, China launched its first Amateur Radio satellite -- named XW-1 -- into space. The microsatellite -- a secondary payload aboard the CZ-4C rocket launched from the Taiyuan Satellite Launch Center -- was launched into a Sun-synchronous orbit with an apogee of approximately 1200 kilometers. XW-1 successfully reached orbit at 0253 UTC. Members of the XW-1 launch team reported they received a beacon from the satellite shortly after the satellite deployed. In the first few days, the XW-1 team will work on the satellite's FM and store-forward transponder mode and its linear transponder mode. Once those tests are complete, they will upload a new flight program to set up the payload schedule. The satellite's communications payload includes a beacon and three crossband transponders operating in FM, SSB/CW and digital modes. Uplink and downlink frequencies can be found on the CAMSAT Web site. For the latest Keplerian elements for XW-1 and other satellites, check out the W1AW Keplerian Bulletins. On February 3, 2006, cosmonaut Valery Ivanovich Tokarev hand-launched the Amateur Radio satellite SuitSat-1 from the International Space Station during an extra vehicular activity (EVA), NASA's term for a spacewalk. 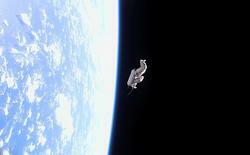 A discarded Russian ORLAN spacesuit, SuitSat-1 was equipped with an Amateur Radio transmitter that transmitted telemetry and greetings from youngsters to the youth of the world in several languages. In 2010, an Amateur Radio satellite -- ARISSat-1 -- will once again be hand-launched from the ISS. Like its predecessor, ARISSat-1 will transmit messages recorded by students, and teachers and students are invited to "fly a file" aboard this Amateur Radio satellite. Read more here. The January/February issue of NCJ, The National Contest Journal, is filled with the latest news from the contesting world. Whether you are new to contesting or are a seasoned pro -- or somewhere in the middle -- you will find something in NCJ just for you. In addition to all of the exciting articles in this issue, there are all the regular columns and features you expect from NCJ: "Workshop Chronicles," by Don Daso, K4ZA; "Contest Tips, Tricks & Techniques," by Gary Sutcliffe, W9XT; "VHF Contesting," by Jon Jones, N0JK; "RTTY Contesting," by Don Hill, AA5AU; "Propagation," by Carl Luetzelschwab, K9LA; "Contesting on a Budget," by Ralph Bellas, K9ZO, and "Contesting 101," by Kirk Pickering, K4RO. NCJ is published six times a year by the ARRL; it is edited by Al Dewey, K0AD. NCJ is what every contester needs in their shack -- subscribe today! Read more here. The January/February issue of QEX is coming soon, and it is full of theoretical and practical technical articles that you won't want to miss. Would you like to write for QEX? It pays $50/printed page. Get more information and an Author's Guide. If you prefer postal mail, send a business-size self-addressed, stamped envelope to QEX Author's Guide, c/o Maty Weinberg, ARRL, 225 Main St, Newington, CT 06111-1494. QEX is edited by Larry Wolfgang, WR1B, and is published bimonthly. The subscription rate (6 issues) for ARRL members in the US is $24. For First Class US delivery, it's $37; in Canada and internationally by airmail it's $31. Nonmembers add $12 to these rates. Subscribe to QEX today. Read more here. For 37 years, Mickey Hicks, WO6T, played Santa Claus to hundreds of children. These children never sat on Santa's lap to tell him that they had been good boys and girls and what they wanted for Christmas. They did it in a much more simple way -- they picked up a microphone and told Santa on the air. Each year, Hicks, a ham for almost 50 years and a long-time Amateur Radio instructor, would get on the air for 10 days each December as W6S (Whiskers-6-Santa). Unfortunately, Hicks became a Silent Key earlier this year. 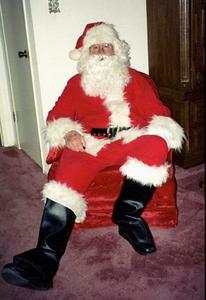 Mickey Hicks, WO6T (SK), played Santa for 37 years on the air, using call sign W6S (Whiskers-6-Santa). Hicks said that the first year he operated as W6S was a hit with the operators -- and their children. Most children, he noted, are a bit apprehensive of talking over the radio, let alone to Santa. One of the most challenging parts of operating was when he heard a parent say "This one is shy and won't talk." That was never a problem for Hicks -- after a few warm-up questions, such as "Can you say hello to Rudolph?" -- he said he could strike up a conversation that lasted a few minutes. He had even heard back from parents that they weren't able to get the microphone away from the kids afterward! Back in 2001, Hicks told the ARRL that his Santa's Workshop was a great ham radio recruiting tool. One of his most memorable experiences was when a young girl he'd once spoken with on the air as Santa came by with her ham ticket in hand to thank him in person for getting her interested in Amateur Radio. "I had tears in my eyes, of course," he said. One of the most enjoyable moments of Hicks' Santa career occurred when he was speaking with a young child and realized he had spoken with their parents and grandparents when they were youngsters! Mark Slater, WI6J, was Hicks' QSL manager. With the blessing of Hicks' wife, son and daughter-in-law, Slater will carry on the W6S tradition for 2010 and beyond. "Mickey's shoes are so much bigger than I could ever hope to fill," he told the ARRL, "but I know Mickey would have wanted Santa to keep getting on the air and speaking with the children." Slater said you can find him most evenings, as well as the weekend of December 19-20, on 14.270 MHz, Santa's favorite frequency. Santa is a ham -- now you know! A vacancy has developed in the position of ARRL Emergency Preparedness and Response Manager. Applications for this position will be solicited before the end of the year with the objective of filling the position early in 2010. Because this is the last scheduled ARRL Letter of 2009, if you or someone you know may be qualified for and interested in the position, please watch for the posting on the ARRL Web site. The Sun, as seen on Thursday, December 17, 2009 from NASA's SOHO Extreme Ultraviolet Imaging Telescope. This MDI (Michelson Doppler Imager) image is taken in the continuum near the Ni I 6768 Angstrom line. The most prominent features are the sunspots. This is very much how the Sun looks like in the visible range of the spectrum. Tad "A friend to man, to whom thou say'st, 'Beauty is truth, truth beauty'" Cook, K7RA, reports: Yet another new sunspot group -- number 1035 -- emerged this week, seemingly on top of group 1034, which has been visible since December 9. This sunspot group is quite active, and we may see a rise in geomagnetic activity on Sunday, December 20 with a predicted planetary A index of 15. 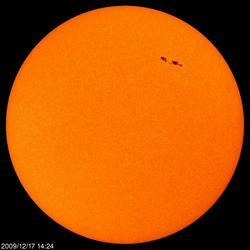 Look for more information in the Solar Update, available on the ARRL Web site on Friday, December 18. For more information concerning radio propagation, visit the ARRL Technical Information Service Propagation page. This week's "Tad Cookism" brought to you by John Keats' Ode on a Grecian Urn. This week, the Russian 160 Meter Contest is December 18. The OK DX RTTY Contest and the RAC Winter Contest are December 19. The Croatian CW Contest is December 19-20 and the Lighthouse Christmas Lights QSO Party is December 19-January 3. The ARCI Holiday Spirits Homebrew Sprint is December 20, the Run for the Bacon QRP Contest is December 21 and the SKCC Sprint is December 23. Next week, check out the South Dakota QSO Party and the Stew Perry Topband Challenge -- both are on December 26-27. All dates, unless otherwise stated, are UTC. See the ARRL Contest Branch page, the ARRL Contest Update and the WA7BNM Contest Calendar for more info. Looking for a Special Event station? Be sure to check out the ARRL Special Event Station Web page. ARRL Headquarters will be closed Friday, December 25, 2009 and Friday, January 1, 2010 in observance of Christmas and New Year's Day. There will be no W1AW bulletins or code practice transmissions those days. There will be no ARRL Letter or ARRL Audio News on Thursday, December 24 and 31. We wish everyone a safe and joyful holiday season and a prosperous 2010. Registration remains open through Sunday, December 27, 2009, for these online course sessions beginning on Friday, January 8, 2010: Amateur Radio Emergency Communications Level 1; Antenna Modeling; Radio Frequency Interference; Antenna Design and Construction; Ham Radio (Technician) License Course; Propagation; Analog Electronics, and Digital Electronics. To learn more, visit the CEP Course Listing page or contact the Continuing Education Program Coordinator.